Hello, my name is Anthony Herrera and I am 22 years old from Cochiti Pueblo, New Mexico. I’m an enrolled college student at CNM majoring in Biology. I have hopes of a future career working in the outdoors with the environment and wildlife. The summer internship of 2018 with River Source has been hands down one of the greatest experiences I ever had in my life! The outdoors is my passion because I grew up hunting, fishing, and farming. For this reason, I was able to start off at a young age to have respect for mother nature and her animals. Partnering with River Source has been a great learning experience for me. Not only have River Source staff strengthened my understanding for the outdoors, but they also motivated me to further my education and pursue my dream. With this internship, I learned skills that will allow me to give back to the environment. I have also gained experience with this internship by working hands on in the field. This experience will benefit me in my dawning years with the future career path I choose, whether it’s a Wildlife Biologist, Forestry Technician, or Game Warden. The 2018 River Source Internship kept me busy all summer! I worked in various locations across New Mexico. Primarily we worked at the Haashuk Cheena (Santa Fe River) that flows through the Cochiti reservation. 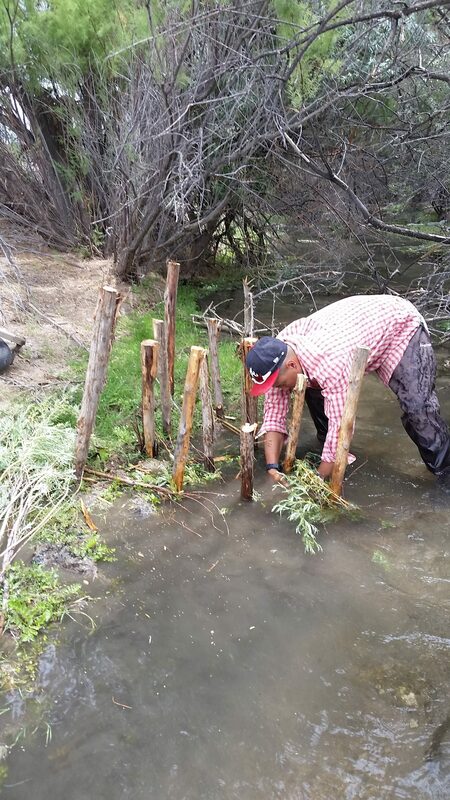 In 2013, the interns for River Source made a restoration plan for the Haashuk Cheena. This restoration plan was made under the supervision and guidance of Kai-t Blue-Sky. Kai-t Blue-Sky, a Wildlife Biologist from Cochiti Pueblo. He graduated from the New Mexico State University and works for the Cochiti Department of Natural Resources (DNR) . This restoration plan focuses on improving the water quality on the river as well as restoring native plant species to the area. By restoring the Haashuk Cheena, it will create a biodiversity for the area’s wildlife. The restoration will also create a refuge for the future generations of Cochiti Pueblo. This will allow future generations of Cochiti people to enjoy the wonders and benefits of the outdoors. The Haashuk Cheena originates from a watershed. This summer I learned you must work from top to bottom when restoring and improving water quality in watersheds. We did exactly that working from East to West with the flow of the river. On first day of work with my internship we went to Haashuk Cheenawe collected water samples and tested the current water quality of the river. Our water quality tests were on four different points of the river. We tested for different things such as streamflow, water temperature, pH levels, nitrate levels, dissolved oxygen, phosphate levels and more. We then deployed Bluetooth Thermographs that would began recording the temperature of the river that night at 12 AM in six different points on the river. The data we collected showed us the current water quality of the river is in fair to good condition but could improvement. One of the goals for the restoration of the Haashuk Cheena project is to bring back Native Cutthroat Trout to the Santa Fe river in Cochiti Pueblo. There are many different factors for a river to support trout. One of the key factors for a trout’s habit is the water temperature. The water temperature to support trout has to be below 20 C (about 68 F). In past years, interns with River Source have planted different trees next to the river to produce a canopy of shade over the river. This will reduce the temperature of the river and will allow for the possibility of stocking the river one day with Rio Grande Cutthroat Trout. During my internship we took a survey of Haashuk Cheena’s canopy to test to see how much shade is produced by the trees. We found out that in areas with less canopy the river’s temperature would rise, compared to areas with more canopy the river’s temperature would be lower. Another fun thing I was able to do this summer was fly a drone! That’s right, I got to fly a drone! It was so much fun! On only my fourth day of the internship I flew a drone over the Haashuk Cheena. While I was flying the drone, I recorded video of my flight path down at the river. This data will be used to analysis the river as well as check for future improvements on the river. This was by far one of my favorite memories of the whole summer! Working on the Haashuk Cheena required lots of physical labor. This physical labor consisted of repairing damaged fences, keeping cattle and horses out of enclosures, building one rock dams, building baffles with rocks and willows, planting and spreading Cota, and transporting rocks to different points on the river. This physical labor reinforced my understanding of importance of hard work. You have to be willing to put in hard work to see change. There is still much work to be done on the Haashuk Cheena but with time and perseverance there will be much more improvements made. This summer I was also able to help teach two youth groups about fishing and water quality. 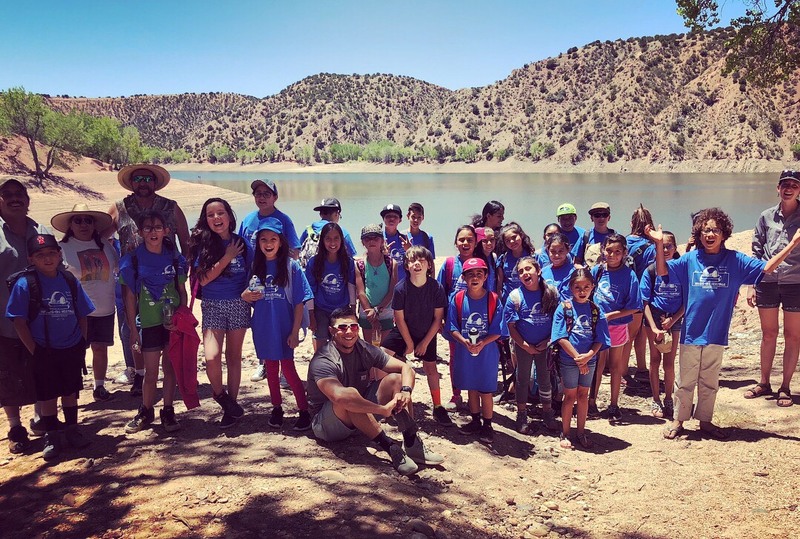 The first group we worked with was the Cochiti Pueblo youth program at Cochiti Lake. They ranged from grades kindergarten through fifth grade. We had three stations for them which included, swimming, water quality, and learning how to fish. It was lots of fun! The second youth group we worked with this summer was called, “Hands-On Heritage”. With that group we drove at Santa Cruz Lake and ran two stations with them which were, learning how to fish, and learning about water quality. Both youth groups caught at least one fish during their time with us and had lots of fun! I found this experience to be rewarding because I was able to engage with the children and make them happy by teaching them how to fish. One of the biggest challenges while working with these two youth groups was patience. This was because I was constantly untangling rods and as well as getting fishing line unstuck in the water. I hope that one day I will be able to work with more youth groups and teach them my passion and love for the outdoors. My summer internship with River Source also entailed working directly with the DNR in Cochiti Pueblo. I had the chance to meet the employees who work for the DNR in Cochiti Pueblo. I learned they must all work together to improve the conservation of the land and wildlife. While working with Cochiti Pueblo’s DNR office I primarily worked with Kai-t. My first impression with Kai-t is that he is amazing. His intelligence and philosophy impressed me when we engaged in conversation. I quickly learned that he had much respect for the environment and wildlife. On my first day working with Kai-t, he taught me some of Cochiti’s history. He had me read a book about the Pueblo Revolt that was here in New Mexico in the early 1800’s. It was a revolt between the Pueblo Native Americans and Spaniards from Spain. From this, I learned that Cochiti played an important role in the Pueblo Revolt because Cochiti led a rebellion against the Spaniards. Learning this history about made me proud to be from Cochiti. Kai-t then introduced me to Phoebe Suina who is an engineer graduate out of the University of New Mexico. She also works for DNR in Cochiti Pueblo. I was able to work with Phoebe and Kai-t on one of their projects with the tribe by helping survey some land they were working on. Working with Cochiti’s DNR office was a rewarding experience that I will never forget! The River Source office is located in Santa Fe, New Mexico. During my internship I was able to work directly in the River Source office with Rich Schrader, Carlos Herrera, and Emily Wolf. I learned so much from these three wonderful people such as uploading and analyzing data we worked on, creating maps with GPS, creating .kml files on google earth, labeling photo points, and much more! One of the main projects we worked on while at the River Source office was shooting repeat photopoints on the Santa Fe Greenway Project. This project was by Santa Fe County on the Santa Fe River that goes through the city. My favorite memory this whole summer is when I was able to spend a day in the Santa Fe National Forest tracking bighorn sheep. I met with Emo Yepa who is a conservation officer with the DNR in Cochiti Pueblo. We headed out to the Santa Fe National Forest at 7 A.M. to help assist the U.S. Forest Service and New Mexico Game & Fish with the bighorn sheep tracking. As soon as we arrived at the meeting location, the U.S. Forestry and the Game & Fish were already there and located a heard of bighorn sheep only 50 yards below us in the canyon. I was able to take some pictures of the sheep in their natural habitat. The reason for the bighorn sheep survey was so that the Game & Fish would know how much bighorn sheep are in that specific area. Eric Rominger, who is a bighorn sheep biologist and who led the survey, was incredible on locating the sheep. I remember being somewhat frustrated that I wasn’t able to spot out the sheep in the canyon how he was. We would be sitting together with our binoculars scanning the canyon and out of nowhere he would say, “found some” or “spotted another heard”. It amazed me how good he was. I was really impressed because I have plenty of experience being in the outdoors hunting and fishing. I like to thing of myself as having a keen eye when it comes to tracking or locating wildlife. This experience is going to benefit my future in so many ways thanks to River Source! I am more determined then ever to finish school and start my career working in the outdoors! I want to thank everyone who helped me this summer further my education and increase my passion for the outdoors. I hope not only to serve my community in Cochiti Pueblo but to serve and help teach anyone who wants to learn on a global scale. A big special thanks to Rich Schrader! Rich taught me the importance of water quality and preserving the land for future generations to enjoy. I hope to see River Source continue with the summer internship program so other students like me to have the opportunity to further their education for the outdoors. We are so grateful to the McCune Charitable Foundation and New Mexico Community Foundation for funding this project and Anthony’s Internship!